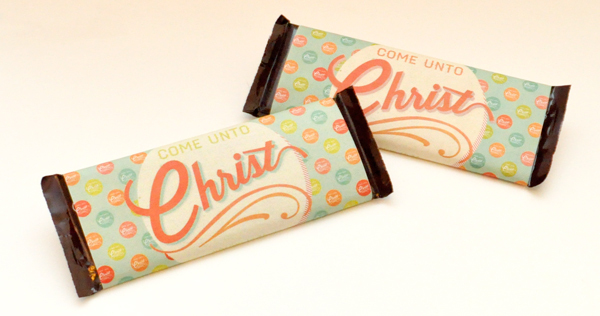 Earlier this week I gave you my 2014 Come Unto Christ YW/YM candy-bar wrappers for the giant 6.8-ounce Symphony/Hershey’s bars. Today I have corresponding 2014 Mutual Theme candy-bar wrappers for the smaller, standard 1.55-ounce-sized Hershey’s bars. When you need a handout for Youth Conference, YW/YM birthday gifts, Girl’s Camp, New Beginnings, Young Women in Excellence, or as Personal Progress/Duty to God motivator/reward, a candy bar with one of these wrappers will grab the attention of your youth. 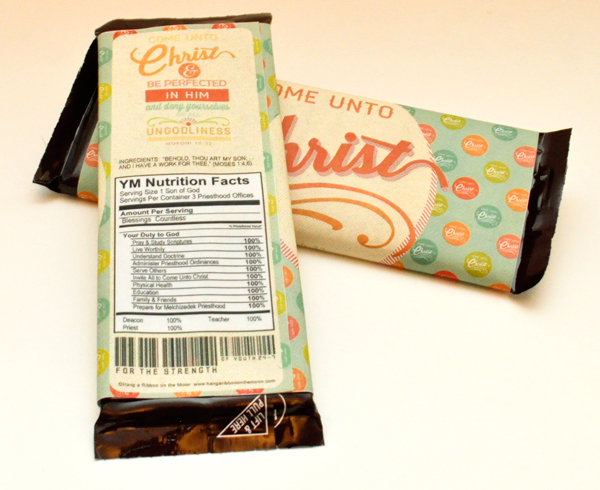 The Young Men’s wrapper has a specially designed Nutrition Facts box featuring the Duty to God program. The Young Women’s version has a Nutrition Facts box full of Personal Progress values. Both the YW and YM wrappers feature the FULL 2014 Mutual Theme on the back. I’ve included JPEG and PDF files for you so printing out these wrappers is a cinch. Be sure to use your printer’s highest-quality setting and you’ll have great results. 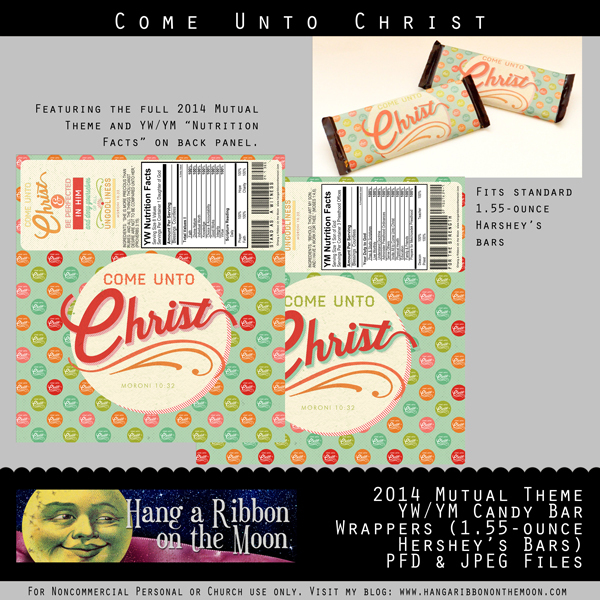 You can download my 2014 Mutual Theme YW/YM Candy Bar Wrappers (1.55-ounce Hershey’s) here. stuff and could never even begin to create the awesome projects you do. I love your work! Thanks so much for being willing to share your time and talents. I really appreciate your help! YOU ARE TALENTED!!!! I LOVE THEM!!!! I am yw pres and my husband is ym pres. I just came across these and we are both using them! Thank you so much!!! So glad you can use them! Enjoy! I am interested to buy the chocolate bar 60 in good price if you well help us we are taking the youth of Puerto Rico to are temple republic Santo Domingo there are paid own expenses . Hi Madeline! I don’t sell the chocolate bars, sorry. 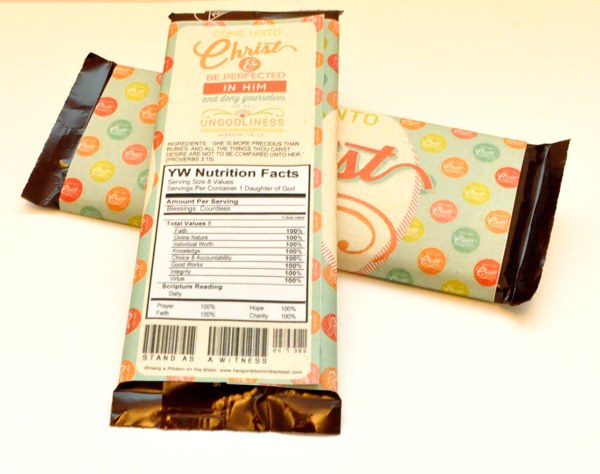 I just create wrappers you can print out and put on your own bars. I hope you can find the candy bars in Puerto Rico. P.S. I once visited your beautiful island! Thank you very much for sharing your talent. I am not talented in this area, so I appreciate your effort to perfect yours! Thank you! Yikes I bought the 4.25 oz, hope i can make this work. But, regardless thank you soooooo much for sharing freely your talents to all of our young women whom will benefit. Hi sister, are you going to design candy bar wrappers with the 2015 theme? You always have fantastic material for the everyone. Thank you!